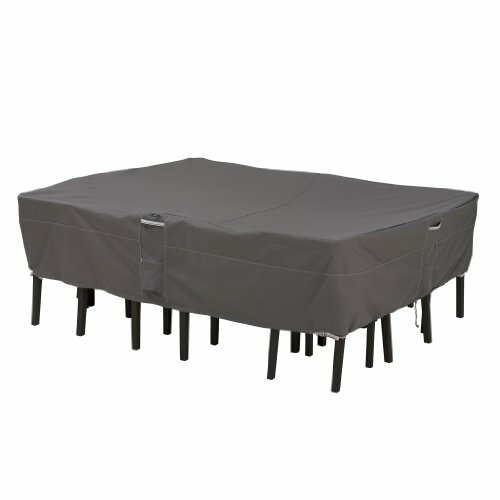 Patio furniture covers are robust, outdoor covers that help to protect your outdoor furniture from the elements. They come in all shapes, sizes, styles, and colors, and are also available to suit various budgets too. What most people appreciate about patio furniture covers is how affordable they are in comparison to new furniture. Would you not rather cover your furniture instead of having to buy new stuff a year or so down the track? Get right to it by checking out these options below and finding a size and style to suit your needs. 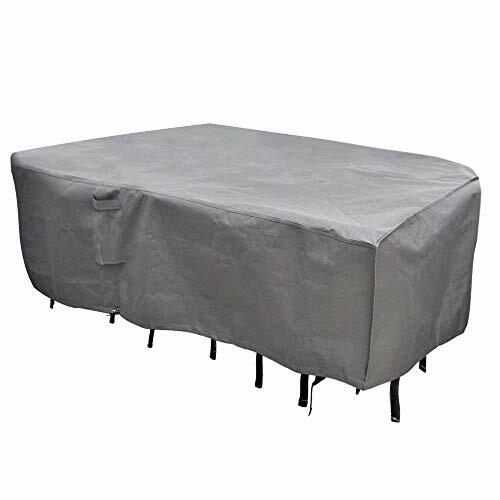 If you would prefer to replace patio furniture covers instead of expensive furniture, then check out this cover from Classic Accessories. Even though they will only last a few years before they fade and rip, they will be a far more affordable option than having to buy new furniture. They are good at their job. You can buy these patio furniture covers for deep seats and in medium and large sizes. They are also available as two and four-packs – perfect for those who either have a full set or only a couple of chairs. When it comes to handling the weather, they put up a good fight for many months. They feature interior bound seams to reduce the risk of them tearing, and the stitching is high-density too. They also fit chairs around 38 x 31 x 35 inches, with a drawstring hem and buckled straps to keep them in place over your furniture. To a degree, these patio furniture covers are resistant to weather and have water-resistant Gardelle fabric that will handle a lot of pressure. They won’t last forever, and the color will fade quite quickly, but these patio furniture covers are affordable and some of the best on the market. If your outdoor furniture configuration is a little unusual and you need large patio furniture covers that will fit, then check out these from SONGMIC. If you thought nothing would be able to keep your outdoor furniture safe from the elements, then think again. 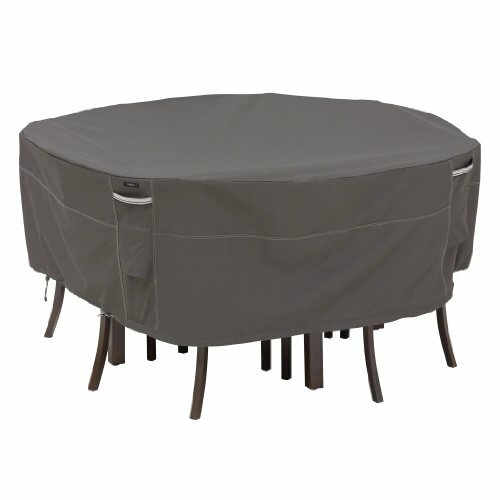 These waterproof, rectangle-shaped patio furniture covers are available in three sizes – 66, 110, and 128 liters. The fabric offers 400g/m2 of weight for additional durability, while the beige and brown or gray color schemes ensure they tie in beautifully with your outdoor area too. However, that’s not all you will like about these patio furniture covers. They resist UV rays far better than other covers, even if they succumb in the end, and they have a robust snap buckle and drawstring closure system. Therefore, not even high winds will see these covers flying away! To reduce the instance of moisture, they also have four air vents. However, there is still a risk of mildew so remove the covers often. These affordable patio furniture covers are ideal for all type of furniture, so if you’re struggling to find a cover to fit, you may get the answer for which you’ve been looking in these patio furniture covers from SONGMIC. If you are always worrying about how the weather will adversely affect your outdoor furniture, then check out these patio furniture covers from PHI Villa. What may first grab your attention is the price tag. It’s exceptionally competitive while being the same across the board for a small, medium, or large cover. PHI Villa has also put a lot of time and effort into making sure its patio furniture covers last the distance too. No matter the weather, they will impress. They are weather resistant, have a pop-up supporter to deflect snow, water, and debris, and even come with a waterproof underside too. A common problem with patio furniture covers is that they sweat, causing mildew to build up and damage furniture. These patio furniture covers don’t have that problem. Because of the air vents, they breathe correctly, while featuring Oxford fabric which doesn’t rip or succumb to the elements. If you want patio furniture covers that will last the longest out of any, then check these two-tone beauties out. 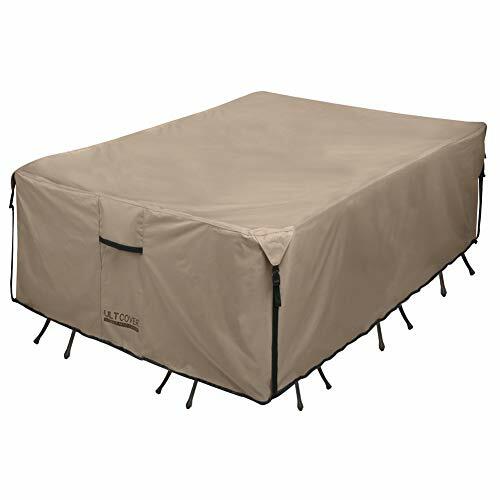 If you have a large sectional outdoor furniture set, or you need large patio furniture covers to keep everything under cover and safe, then check out this product from Patio Watchers. 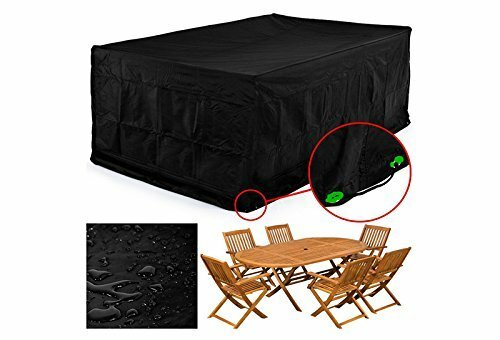 These patio furniture covers work perfectly with most sets of furniture. Choose a size to suit – medium, large, and extra-large, and immediately get protection for your belongings! There are many features to love about these patio furniture covers. They are water resistant, have woven fabric with high-density stitching, and will handle a whole lot of adverse weather conditions. They can rip, but it’s highly unlikely that it will happen. These patio furniture covers also come with air vents to stop moisture building up underneath, but they are not 100 percent effective so you will need to give them additional breathing space. Once you put the cover onto your furniture, you can then buckle them up and let them handle all weather that comes their way. They are durable, contemporary, and long-lasting covers that are likely to impress. Aside from it not being as waterproof as other brands, and merely being resistant to some water, these patio furniture covers from TRIARMOR could solve all your outdoor furniture storage woes. If you continually battle with harsh weather conditions ruining your furniture, then why not let a cover take the brunt of it? Over time, these patio furniture covers will wear out, but they are a far sight more affordable to replace than outdoor furniture. These covers, in particular, are also going to last longer than many. They feature robust polyester fabric, have click-close straps to keep the covers securely in place, and even have loop handles to make it easier to put them on and take them off. Their generous 28 x 94-inch dimensions also ensure they fit more styles of outdoor furniture than other brands. If the time has come to invest in the protection of your outdoor furniture, then check out these covers from TRIARMOR. The quality, robustness, universal fit, and ease of use will all have you opening your wallet in no time. For those people who have six chairs in their outdoor set instead of the more common four, you may find it’s challenging to come across patio furniture covers that fit. Many options on the market are more suitable for smaller sets of four. These patio furniture covers from Duck Covers, however, are going to blow you away with their versatility. Because you can buy them in 76, 90, and 108-inch sizes, at least one dimension is bound to fit your outdoor furniture set. What’s more, they are shaped to suit up to six chairs with short backs on them to stop water from pooling. 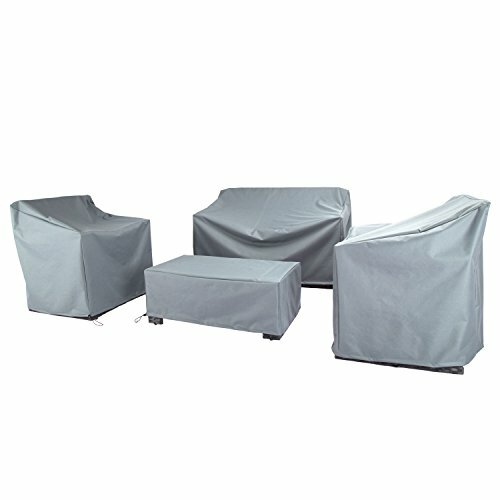 These patio furniture covers come with a two-year warranty for peace of mind, durable fabric, and seam sealer tape to reduce the risk of water making its way through to your furniture. However, pay careful attention to the material. It’s far better quality than others on the market but will still fade and lose its structural integrity over time. Its UV-resistance only works to a degree. In high winds, these patio furniture covers come into their own. Thanks to the shock cords, nylon straps, and side-release buckles, they hold onto your furniture tightly. The risk of them coming off and leaving your furniture exposed is slim. 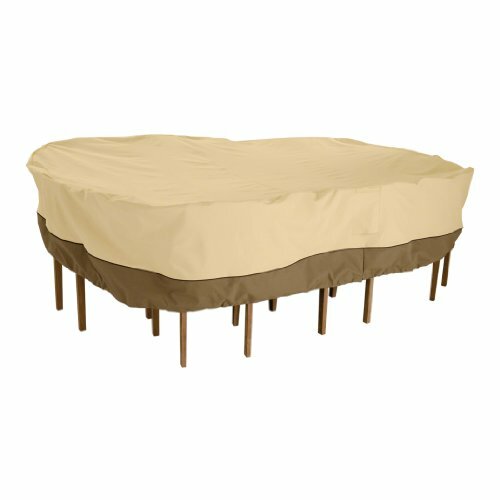 Consider buying these patio furniture covers from Duck Covers when you want protection that lasts. Most patio furniture covers on the market protect your patio table and chairs, but what about your chaise lounge? Should you let it rot away to nothing in the elements? Duck Covers ensures you don’t have to. Their chaise lounge covers are available in seven sizes – ideal for a full selection of chaises. All chaise patio furniture covers come with a two-year warranty, water-resistant fabric, and seam sealer tape to stop moisture making its way underneath. However, in heavy rain, this is still a possibility. The material can combat a range of weather conditions, but eventually, it can lose the fight. It will begin to fade, lose its structural integrity, and rip in places. That’s not to say these patio furniture covers still don’t do their job. They last for a long time, remain secure even in high winds, and have a lovely color scheme too. You can put them over your chaise lounge, secure the straps, buckles, and shock cords in place, then go inside with the peace of mind your furniture has protection. These patio furniture covers may not last forever, but they continue long enough to offer unparalleled protection for as long as you require. If you own an Adirondack chair, then no regular patio furniture covers will be suitable. Instead, you want to reach for this Adirondack chair cover from Classic Accessories. Nothing will fit like a glove with more ease than this chair cover. At 36 x 31.5 x 22.5 inches, it slips onto the chair effortlessly, then begins protecting it from the elements right away. Its water-resistant Gardelle One polyester fabric protects it from rain, while the custom-colored buckles, elastic hem cords, and padded handles ensure everything remains in place while it’s windy. The best part is, there is no slack – it fits like a glove. What you will also appreciate about this chair cover is that it comes with a lifetime warranty. Even though it’s affordable, as long as you follow all care instructions, you can receive a replacement if it fails in its duty to protect your Adirondack chair. It’s also available in a contemporary gray color scheme to seal the deal. There are only two points that may have you hesitating in choosing to buy this chair cover. It doesn’t breathe well so can cause mildew if you don’t store your cushions indoors, and it doesn’t cover the wheels or legs. 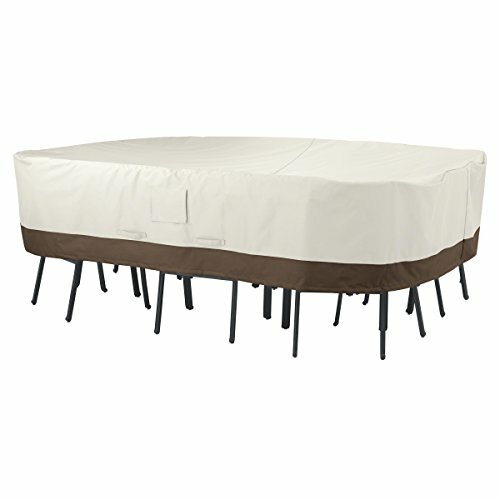 These minor points aside, out of all patio furniture covers, this one would have to be one of the best for sale online. Apart from minimal leg coverage and fading in the sunlight, these patio furniture covers from Classic Accessories will become a firm favorite. Not only do they ensure your furniture remains protected in all weather – but even your fire pits. No part of your outdoor entertaining area needs to succumb to the element when there are patio furniture covers for everything! 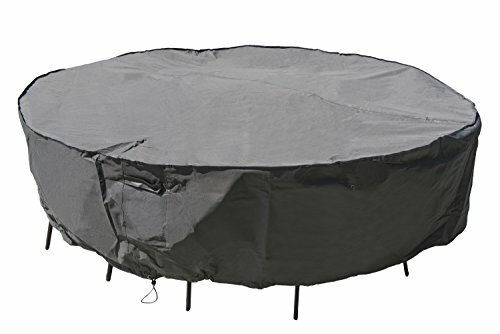 This cover is ideal for either a small or large fire pit by Ravenna. It features robust, high-quality and water-resistant fabric, comes with a limited lifetime warranty, and also has a UV coating to stop it from fading. However, given how quickly it loses its contemporary gray color, it’s clear to see this doesn’t work all that well. What these patio furniture covers excel at, however, is protecting your furniture in high winds. They have elastic hem cords, buckles, and padded handles – all which contribute to keeping the patio furniture covers in place and protecting your furniture. Even moisture isn’t a problem thanks to the inclusion of air vents. Even if you don’t have a Revanna patio set with which these patio furniture covers are compatible, you may still find the cover is useful for protection now and into the future. How many sets of patio furniture have you thrown away because the weather and elements have destroyed them? Probably too many to count. While outdoor furniture is made for use outdoors, it’s not meant to handle a lot of weather conditions. You are supposed to protect it. From now on, instead of buying new furniture, why not buy new patio furniture covers? The price difference is significant. Fortunately, you can also make even more savings by doing your due diligence on the type of patio furniture covers to buy. Not all are going to be suitable, but if you consider these points below, the one you end up buying is more likely to be right than wrong. Before you even begin looking for patio furniture covers, take your tape measure outside and set up your dining set how it would be if you were to cover it. Take all the measurements then write them down. Failure to know the correct size patio furniture covers you mean can result in a lot of hassle and returns. If the weather can kill your outdoor furniture, then it can kill patio furniture covers too. To give your new cover a fighting chance of lasting the distance, buy the best material on the market. Usually, this is a type of Oxford fabric which is thick, woven, and resistant to water. Anything less than that is not going to handle the weather. Patio furniture covers have to put up with a lot. If it’s not the torrential rain testing them to the limits, it’s the heavy snowfall, gale force winds, and intense sunshine. Before you pick any particular patio furniture covers, find out what the manufacturer has done to weatherproof the cover. Does it have a UV-stabilizing coating? Is it resistant to water? Does it have straps and buckles to keep it tightly on your furniture? If it has nothing at all, move onto another brand. Most people believe that the more you spend, the better quality product you will get. That’s true in a lot of cases, but not in the instance of patio furniture covers. The durability of your patio furniture covers can be a case of winging it. Don’t organize your potential options by price, but rather by what you like. You can then narrow it down further to see which will stand up to the elements. The price rarely has anything to do with it.